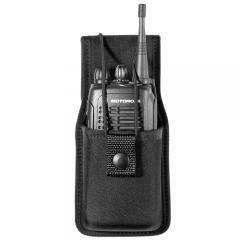 The Bianchi PatrolTek 8014S Universal Radio Holder provides convenient hands-free carry for your communications device, and fits popular models including the Motorola MT500/MT1000 and Saber. It is made from sturdy, contour-molded trilaminate, with a wear-resistant 600 denier woven exterior. The open top design allows easy access to your radio, while a snap-fastened elastic security strap keeps it firmly inside the holder when not in use. The strap is adjustable to fit different radio sizes. The holder features a two-piece adjustable swivel belt mounting system that accommodates a range of carry angles and fits 2 or 2.25 inch belts.